DeFelsko Corporation offers a number of instrument solutions ideal for ensuring correct practice for the practical application and quantitative measurement of polyurea coatings applied to concrete, metal and other materials. Technologically advanced as it is, applying a polyurea coating to a contaminated or otherwise improperly prepared substrate, or in conditions unfavorable to proper adhesion, or to a thickness not specified for the desired level of protection may each contribute to a polyurea coating’s failure to meet cost and performance expectations. The recent standard, SSPC-PA 14 “Application of Thick Film Polyurea and Polyurethane Coatings to Concrete and Steel Using Plural-Component Equipment”, provides comprehensive guidance in obtaining desired performance from polyurea coatings applied to concrete and steel substrates. Assuming a proper quality control procedure for a concrete substrate is in effect and that the surface to be coated is deemed sound and clean, attention must be paid to the concrete’s physical surface texture (also known as the anchor or surface “profile”). SSPC-PA 14 requires that the surface roughness is visually compared to ICRI (International Concrete Repair Institute) CSP (concrete surface profile) coupons and fall within the CSP range of 2-6 unless otherwise specified. Polyurea systems applied to steel have similar surface preparation requirements as per SSPC-PA 14. 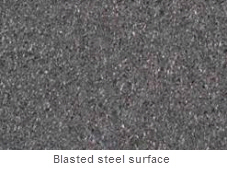 Prior to coating, the steel surface must be prepared in accordance with either the project requirements or as specified by the coating manufacturer to be clean of both visible and nonvisible contaminants. Additionally, the steel must possess a minimum surface profile of 76 µm (3 mils) as measured in accordance with ASTM D 4417 Method B. As described under Method B, the PosiTector SPG (pictured) is ideal for quickly determining the surface profile of the steel to be coated. Various demonstrations of polyurea coating systems have involved spraying the coating over ice and water with no effect on the components’ reactivity. Although impressive from a technical perspective, conditions such as these are unlikely to be encountered in real-world applications (SSPC-PA 14 specifically prohibits the application of polyurea coatings to a frosted or ice-coated surface). While the ambient and substrate temperatures may have little effect on the reaction and cure of a polyurea system, applying any coating over a substrate that is excessively wet or cold may have negative effects on adhesion. The proper application of a polyurea coating system requires that industry standard practices be followed and that the substrate temperature is 3° C (5° F) above dew point and rising, as specified within SSPC-PA 14. Surface preparation and coating application should be performed under optimum environmental conditions to help prevent potential coating failure. A major factor affecting the long-term performance of polyurea coatings on concrete and steel are the climatic conditions present during pre-treatment and the coating application. Handheld, electronic devices enable painting contractors, inspectors and owners to measure and record applicable environmental conditions. The PosiTector DPM Dew Point Meter (pictured) monitors and records climatic conditions including: relative humidity, air temperature, surface temperature, and the difference between surface and dew point temperatures. The primary purpose for measuring coating thickness is to control coating costs while ensuring adequate protective coverage. Commercial contracts often require an independent inspection of the work upon completion. Given the widespread use of polyurea coatings and linings in containment systems, ensuring proper thickness is essential. that the test area be repaired before the structure can be returned to service. ASTM D6132 and D7091 detail a non-destructive test method, eliminating the need to repair the coating after inspection, and saving time and expense for both the inspector and the contractor. Non-destructive methods include magnetic and eddy-current principle gages for metal substrates and ultrasonic gages for non-metals such as concrete. Non-destructive measurement of polyurea thickness on metal substrates is a straightforward process, provided that the instrument being utilized has a measurement range appropriate for the expected thickness. 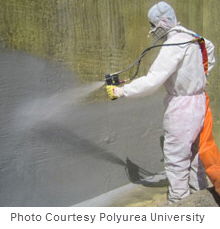 Polyurea coatings achieve a total expected thickness by applying multiple layers on one another (a technique aided by its fast-cure properties), so it may be necessary to monitor the individual layer thicknesses. If the polyurea coating is being measured in accordance with the requirements of SSPC-PA2 and PA9, then the thickness of each individual coat must meet project specifications, regardless if applied to concrete or metal substrates. The PosiTector 6000 Series of Coating Thickness Gauges are designed for simple operation and are ideal for measuring the thickness of polyurea applied to ferrous and non-ferrous metal substrates. Since polyurea coatings applied to non-metal substrates cannot be measured by magnetic or eddy-current principle instruments, an ultrasonic gage is required. Ultrasonic measurement testing equipment such as the PosiTector 200 D operates by sending a high-frequency ultrasonic pulse into a coating using a probe (i.e. a transducer) with the assistance of a couplant applied to the surface. In simple terms, the time required for the ultrasonic signal to pass through the coating and bounce back from the substrate is used to calculate the coating thickness. The PosiTector 200 D Series of Coating Thickness Gages was engineered specifically to measure very thick, flexible and acoustically attenuative coatings including polyureas. PosiTector 200 D Advanced models have the ability to measure up to three individual layers in a polyurea coating system with a single reading. Concrete substrates tend to have higher surface profiles than metals and may exhibit varying degrees of porosity, which may cause coating thickness measurements to vary significantly depending upon where the probe is placed. In this circumstance, a method of averaging should be used to determine an overall coating thickness. 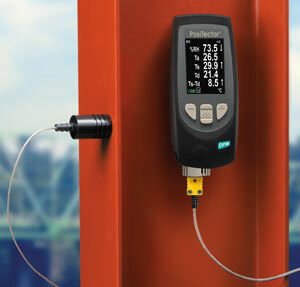 The PosiTector 200 D Series of Coating Thickness Gauges use proven ultrasonic technology to measure the thickness of polyurea coatings 50 – 5000 µm (2 – 200 mils) applied to concrete, wood and other non-metal substrates. 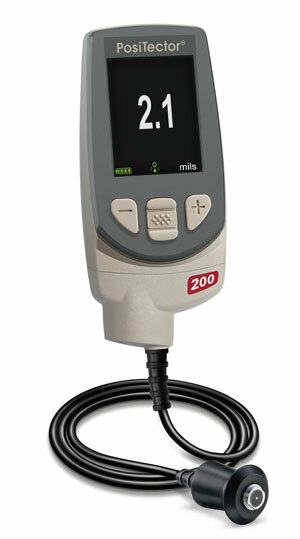 PosiTector 200 D1 (Standard model) measures the total thickness of a polyurea coating system. PosiTector 200 D3 (Advanced model) measures the total thickness or up to 3 individual layer thicknesses* within a multilayer polyurea coating system and features a graphic readout for detailed analysis of the coating system. *Minimum individual polyurea layer thickness 500 μm (20 mils). Due to the challenges associated with measuring a polyurea coating system applied in multiple passes, we typically recommend our PosiTector 200 D3 Advanced. When combined with a PosiTector 200 probe, the Advanced model offers a Graphics mode which displays a visual representation of the ultrasonic pulse as it travels through the coating system. 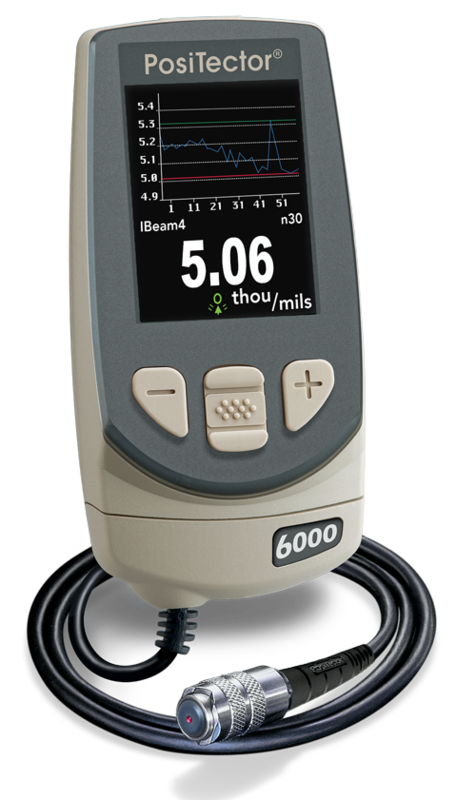 This visual display greatly simplifies the process of adjusting the gage (if required) and promotes operator confidence in the displayed thickness readings. Given the innate adhesion and tensile strength properties of polyurea coatings, it is unsurprising that SSPC-PA 14 demands relatively high adhesion strengths in comparison to other thick and/or flexible coating types. 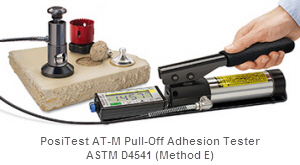 When adhesion testing on steel substrates is performed in accordance with ASTM D 4541 Method D & E, SSPC-PA 14 specifies an adhesion value of at least 6.8 megaPascals [MPa] (1,000 pounds per square inch [psi]) for each of the three pulls required, unless otherwise specified. Furthermore, SSPC–PA 14 requires that when testing adhesion to concrete (as described in ASTM D 7234), each of the three pulls must result in a cohesive failure within the concrete substrate and the polyurea coating remain adhered. In light of these requirements, a 20 mm dolly - providing a maximum pull-off strength of 20 MPa (3,000 psi) - is recommended for testing the majority of polyurea applications, regardless of substrate composition. The PosiTest AT Pull-Off Adhesion Tester (available in Manual or Automatic models) accurately measures the bond strength of polyurea coatings applied to any rigid substrate. Although commonly referred to as a specific coating type, “polyurea” is more accurately described as an elastomer technology wherein a reaction occurs between an isocyanate component and a resin blend component without the use of a catalyst. While a gross oversimplification, this description nonetheless encompasses the basic properties of a polyurea system: a fast-reacting, plural-component system which is virtually unaffected by ambient moisture and demonstrates a rapid and consistent dry time over a very broad temperature range. Introduced in the late 1980s, polyurea technology possesses unique characteristics in addition to those previously noted: excellent adhesion, smooth surface flow out, superior tensile strength and flexibility, resistance to impact, heat and fire, high abrasion resistance, and long-term stability. Because of their versatility, strength and longevity, polyurea coatings are primarily used to protect and add structural enhancement to concrete and cementitious substrates. 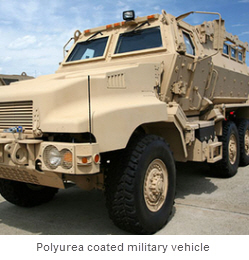 Other typical applications include construction vehicles (bed liners), ATVs, roof coatings, pipes, primary and secondary containment systems, parking garage floors, and military vehicles (blast mitigation). The rapid cure rate is a key advantage, allowing for a fast return to service. In all instances, however, achieving the expected coating performance requires that good practice is followed in regards to surface preparation and physical deposition.